Stag do parties have gone back thousands of years. It’s tradition for the guy getting married to want a fun and final party with all of their mates. Unfortunately, when it’s not well-planned, it can be difficult to have an exciting time together. Whether you will be with just your buddies or will have a party that is gender-mixed, you need the right stag do dares and challenges to ensure that everyone involved is going to have a great night out. For this challenge, the future groom won’t be able to say no for an hour. This can start off pretty easy with simple questions being asked but can turn into a daring challenge where they can’t say no to performing some type of disgusting feat or behaviour. You can also get others involved with the game when the first person’s turn is up. Truth or dare is one of the oldest games played and can be a lot of fun, even as an adult. The idea with these stag night challenges is to have your group ask each other, “truth or dare” and have them pick one. They will then either have to tell a secretive truth about themselves or they will have to do some type of dare. When drinking is involved, as is for most stag parties, things can get pretty wild and create a fun night full of exciting endeavours. An escape room is one of the wonderful bucks activity ideas because it gets the whole group involved with something that is highly engaging and interesting. The room is designed to have different clues available that will need to be solved in order for you and your group to get out of there. You will have a specific time limit for how long it takes to get out of the room. Many rooms are quite challenging, and they can range in theme from romantic to downright horrifying. One way to make the groom’s night really interesting with stag day challenges is to do a fanny pack surprise. With this challenge, it is up to you and your mates to fill a fanny pack with weird, disgusting and downright embarrassing items. Instruct the groom to hand out the items to women and other members of the party or event. Make this challenge really weird by picking out items that you know are going to be a shocker for anyone involved. Have the groom or anyone else at the party sing for an hour. Anything they say has to be done with a singing tone as if they were in an opera. If they fail to sing when talking to others, create some type of penalty like having to take off their underwear or do some type of weird, disgusting or embarrassing dare. With the proper stag party challenges ideas, you will be sure to have a party that you simply cannot forget. After all, this is the groom’s last night of freedom and they should be able to enjoy themselves with their mates doing things that are memorable and a ton of fun. 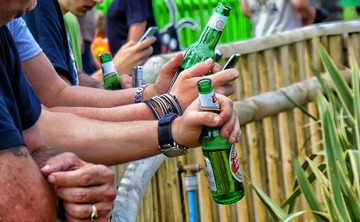 Be sure that when you try out any of these funny stag-do challenges that you have a camera and phone ready so that you can record the entire night and share it on social media or have it available for life. While the night might pass quickly, the memories that you are going to have of all of the weird and silly dares and challenges you’ve done will last a lifetime. Before holding the party, make sure that you have a clear set of challenges and party ideas that you want to put into play so that nothing is left for last minute. The longer you give yourself to plan out the bachelor party, the better off everyone will be. Yazi Jepson is a freelance writer, currently based in SE-Asia. Yazi researches and writes content for several brands around the world. This time, she writes for Centrefold Strippers, an entertainment agency who has a provocative approach to hens and bucks parties.